The above text is the First Amendment to the Constitution of the United States of America. Notice clearly what it states: First, Congress shall make no law in an attempt to either establish a religion or prohibiting the free exercise of that religion. Second, Congress shall not make any law that will abridge the freedom of speech or the press. Third, Congress may not prohibit (via created law) the peaceable assembly of the people of the United States nor shall it limit or prohibit the people to petition the government with any grievances they may have regarding that government. Sedition often includes subversion of a constitution and incitement of discontent towards, or resistance against established authority. Tech companies like Apple seem to be big on attacking hate speech. 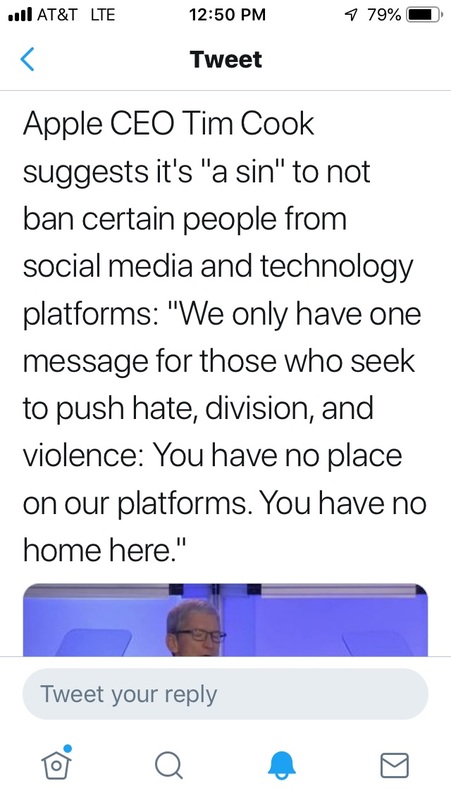 Even though CEO Tim Cook is not part of the government, consider what he has most recently stated about what the Left calls hate speech (see image). Notice in the image of Cook’s quote, he it would be a “sin” not banning certain people from social media. Leftists love to refer to the Bible when it suits them, as I’ve mentioned previously. Cook and many others like the executives at Google, Facebook, Twitter and elsewhere, are banning conservatives under the guise of “hate speech,” while allowing people who wish for the death of President Trump or his family, to continue posting their diatribes without any form of censure or banning. This is routine on social networks because most of them are owned by far left-wing people. Twitter has even allegedly shadow-banned several Republican politicians. Cook believes that people who “push hate, division, and violence have no place” on social network platforms. Again, this boils down to the Left’s meaning of “hate.” The clear hypocrisy is seen when those on the Left push their hate, division, and violence, but are never or rarely censored for their views, while conservatives are regularly suspended or banned for the most innocuous posts. The idea that a company can ban or censor someone based on the nebulous and always moving idea of what constitutes “hate” speech is absurd. “Hate speech” is not recognized by the Constitution because it doesn’t exist. It is merely an artificial construct created by the Left to shut down all opposing viewpoints. All speech is protected by the Constitution and if people don’t want to hear a particular point of view, that’s fine. They have that option to change the channel or go away. Tim Cook has made it very clear that he wants all people who “hate” to not be allowed in the public square. Who gets to decide what constitutes hate? The Left. Yet, the Left is allowed to say some of the most vile comments and nothing is done. They have that right to speak their minds and they want that right. They do not want that right for anyone opposed to their viewpoints. If I defame someone, the First Amendment allows me to do that because it does not limit my speech. However, can I suffer legal repercussions? Yes, if the person I have defamed decides to sue me in court. If I lose, I may be required to pay a fine and issue a public apology. However, there is nothing in the First Amendment that says I cannot say those things. Laws are in place to protect people against defamation, but these laws do not mitigate the First Amendment. We need look only to GAB, a new social network where free speech is actually allowed and upheld. How do Leftists deal with this new social network? They pressured banks and even websites that host GAB to cancel working with them. Apple refuses to include the app for GAB in their App Store. This is nothing more than censorship, plain and simple. They say that “hate speech” occurs at GAB, so they blatantly ban it from their platforms (Apple Store). This is censorship and the Left has no problem with this…as long as they are allowed to continue to say whatever they want to say without repercussions. But it also proves to us that the Left is really made up of what we would call “snowflakes,” though they often try to label conservatives as being that. The derogatory remark is directed at people who cannot handle opposing opinions, so by labeling them “hate” speech, it’s a way to use peer pressure to silence people without having to change laws. Let’s understand something here. As Christians, this unconstitutional censoring by the Left can and does affect our lives. Recently, a Christian pastor, who had converted from Islam to Christianity, was arrested at a mall in Minnesota for sharing his testimony in a private conversation with someone at the Mall of America. He was not standing up on a podium with a loudspeaker and microphone. But what happened to him? He was arrested because, as the guards who detained him said, “You cannot talk about religion here.” Good Lord is this Communist China where you can be thrown in prison for carrying a Bible?! This is absurd! Where does it say that a person must leave discussion of their religious beliefs out of the public forum? A person can actually be arrested for this?! But this is what the Fascist Left wants for America in spite of the First Amendment that guarantees to uphold my right to say what I want to say. The arrest of the pastor reminds me of an event in the book of Acts where apostles were arrested and beaten by Jewish leaders for preaching about Jesus. They warned them not to speak of Him again. The apostles’ response? Here is a perfect example of the Christian not obeying the “law” of the land if it conflicts with God’s law. Of course, Christians must be careful to submit to authorities as stated in Romans 13 because ultimately, all leaders in power are there because God has either directly placed them or allowed them to be there. However, it is clear that “submitting” in this instance does not mean rolling over. It means to humbly go along with authorities even if you are arrested for speaking about Jesus. Then, use the system to legally fight your case but continue to do so with humility and respect. The point is that if someone comes along and demands we stop speaking about Jesus, we can humbly tell them why we cannot do that. If we are arrested for it (and I still find it hard to believe this happened in America! ), we then submit ourselves to those arresting us trusting that God will work in and through the situation for His glory and our growth. In parts of Texas, Muslim students are provided prayer rooms at school, while athletes are told they cannot pray before games. In the Mall of America, Pastor Parsa was detained and handcuffed to a chair. There, he waited for four hours until police arrived. He was denied the use of the bathroom or counsel. Parsa’s pretrial hearing is scheduled for December 11th. If charges are not dropped, he will go to trial. All this because he was speaking one on one with another individual at the Mall. I’m still trying to find out which law he supposedly broke. Again, this was a private conversation between two people in a public place. While the Left likely reads this and laughs, I wonder what their attitude would be if this actually affected them? But historically, this is what one dictatorial regime after another has done. If they can silence people, they have won and this is being accomplished in the United States today by means of Cultural Marxism (political correctness), as opposed to what is happening in our countries like the UK, Canada, and parts of the European Union, where actual laws are being passed that make it a crime to speak negatively about Islam (UK, Canada), or to speak against immigration (EU). 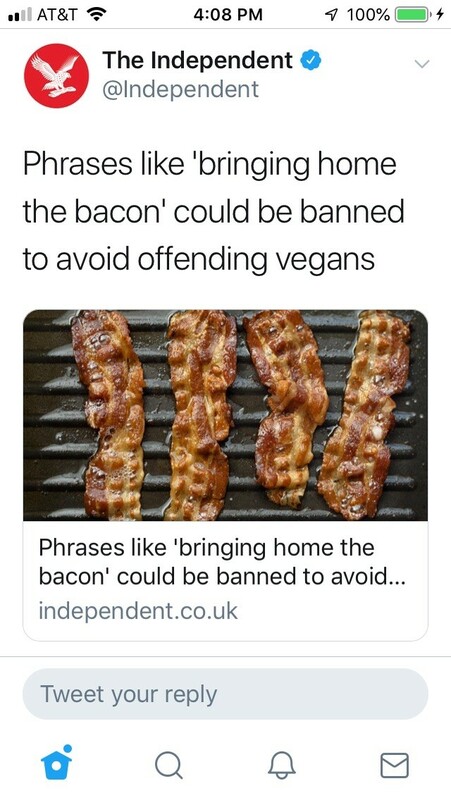 Even groups like PETA are getting involved, telling us that phrases like “bringing home the bacon” will become a type of “hate” speech and should no longer be used because it is “harmful” to animals. The absurdity is so evident among critically thinking people, but this is presented with straight faces by factions of the Left. Many countries are caving into the demands of Cultural Marxists who argue that people do not have the inalienable rights (on paper) that we Americans have. People of all cultures, races, and walks of life actually do have many inalienable rights, but the Constitution of the United States of America actually spells it out guaranteeing these rights that already exist. The Constitution does not grant these rights to Americans, so much as it agrees with and promises that these rights should not be infringed. You may well find yourself in the same situation as Pastor Parsa who was literally arrested for sharing his personal testimony with one person in a public place. Do you understand what that means? Are you not appalled? If it comes to that, as Christians, we must willingly submit ourselves to the authorities if they decide to arrest us, but we cannot stop talking about Jesus, God the Son, who gave His life for us that we might have eternal life. We cannot even consider closing our mouths, in spite of any laws that might be put into effect. Folks, there is no such thing as hate speech. It is an artificial construct the Left uses to push their narrative. If we want to define hateful or spiteful words, then it is clear that there is as much of that happening on the right as there is on the left. That said, the Constitution guarantees my right (and yours) to speak your mind. Life may well get bumpy up ahead. Be prepared for it. Be sober minded. Keep your eyes focused on Christ, who did not cower when faced with violent opposition, but stayed the course and submitted Himself to God the Father’s will. In America we all have the inalienable right to speak freely. No one can take that away by calling what they don’t want to hear “hate speech.” It doesn’t exist. Speak your mind! Entry filed under: Agenda 21, Atheism and religion, christianity, Communism, Cultural Marxism, Demonic, devil worship, Emotional virtue, eternity, Global Elite, Gun Control, Political Correctness, Politically Correct, Politics, Religious - Christian - End Times, Religious - Christian - Prophecy, Religious - Christian - Theology, salvation, Shadow Government, Sharia Law. Tags: first amendment, free speech, pastor parsa, second amendment, shadow banned, twitter. God of All Comfort	Hebrews 4: What is the “Rest” Mentioned? And it will only get worse. FB said my comment calling false teacher “wolves” was against community standards because it was “hate speech”! Yes, and as we know, hate speech is anything the Left doesn’t want to hear.